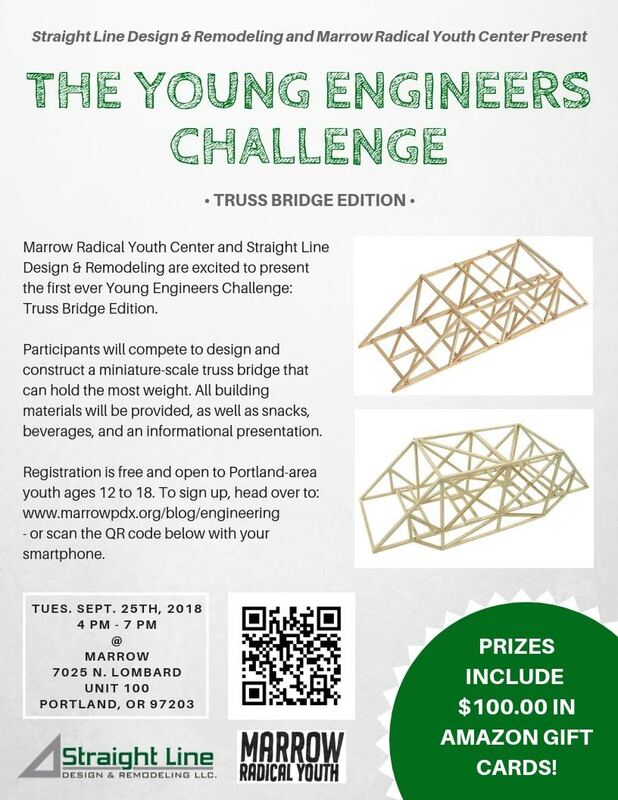 Marrow is excited to announce that we’ve teamed up with Beaverton’s Straight Line Design & Remodeling to bring you THE YOUNG ENGINEERS CHALLENGE: TRUSS BRIDGE EDITION!!! Come have a snack, learn about truss bridges (what are they? how do they bear weight?) then join up in teams and use our supplies to build your own miniature truss bridge! There will be $100 in Amazon gift cards awarded to winners!! FREE and open to all Portland-area youth aged 12-18! No experience or expertise necessary, just come with your creative mind! If you have any questions feel free to reach out to Marrow at info@marrowpdx.org or the organizer at Straight Line at sebastian@straightlinedr.com !